​Against overwhelming odds, rewriting cricketing history , India won. Hey , you must be having some misconception. England won the game. Surely England lifted their fourth world cup title, but team India has won a billion hearts. Rightly said dude. Add one more it. This thought might twitch your mind too . But what a jovial journey it’s been for the Indian Women’s team. From facing qualifiers to playing the main event, their prolific performances have left us all awestruck. You remember, no one paid a penny for the final of Women’s World Cup in Sydney four years ago. Who would have even paused to watch them play? Guess what! Now they don’t just pause, they pay. Before the commencement of Women’s World Cup, would anyone ever discuss of this tournament on their dining table? Not many would be aware how close Mithali Raj was to breaking the world record. On the field, records have been shattered, the World Cup has seen more runs, more wickets and more players than ever before – competing for records on the global stage. India’s remarkable win against six -time title winners Australia, on a stage as massive as the semi finals is something that would remain etched lifelong. Statistics and norms were smothered by Harmanpreet Kaur’s unbeatable score of 171 off 115 balls . On a high after a sensational semi-final win against formidable Australia, India had already scripted history and pulled off an inspired performance to earn a place in the final. The final between India and England has been simply exhilarating puddled with series of surprises, predictions , pressure and thrills . Suicidal run out , dropped catches, missed stumpings, batting collapses. This final witnessed all. At the end of it England won by the finest of margins, but that won’t matter a jot. What did matter was that people back home, in the stadium as well as over television would have a different perspective about women’s cricket. The biggest crowd ever to attend an ICC Women’s World match- more than 26,500 tickets had been sold for the event with only MCC Members able to purchase any remaining tickets. The game witnessed unprecedented media coverage, for the first time ever all the matches were shown live. About 80% higher global viewership was estimated across the course of the events. Global TV audience reach of more than 50 million. 32 million page views on ICC Women’s World Cup website and app and 75 million views of ICC video content. That’s how humongous the stage was. Just being a bit superstitious, the light shower just at the tail end of the match pulled in some sort of misfortunes from the beguiling clouds. Ahh! Fickle fortune. I could actually feel the Lords gloating. The night was a testimony of shooting stars. Not just one or two, but eleven of them. And all descended down on earth as gleam of hope, fire of the future. Though India couldn’t lift their maiden World Cup , women in blue ensured their gritty efforts blend to form a spectacle. Nonetheless, a milestone for the game, and for women’s sport in this country. And the stellar night stood stunned of the splendor of the show. 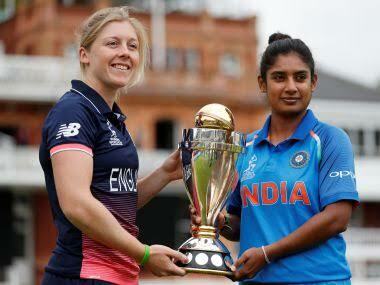 Raj has been called the ‘Sachin Tendulkar of women’s cricket’. Mithali Raj just could be more appropriate.